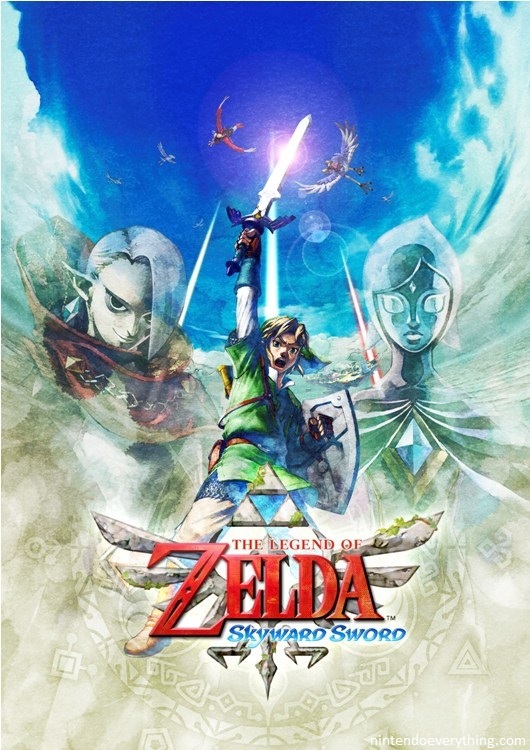 After just completing The Legend of Zelda: Skyward Sword, I definitely have that feeling achievement and reflect on the quality of the game. Overall, I would give it a lot of credit for living up to the hype and certainly would say that I appreciated the combination of the Twilight Princess models with the Wind Waker cell-shading technology. There are a number of critics that have issue with the art design, but I think it works well with the style of game created. Without being all dramatic with providing a score at the end of a long analysis, I will simply say that it is worth the wait and the cost, especially with the added elements of a Hero Mode (replay with greater challenge) and Boss Mode (fight after fight of each boss completed in the game). Link – A young man, seemingly an orphan, who is a student at the knight academy in Skyloft. Unaware of his role as the hero of destiny, he is the childhood friend of Zelda. 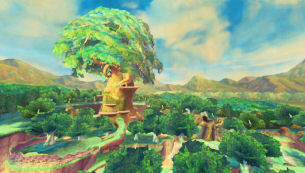 Zelda – Daughter of the academy’s headmaster, Zelda has always been a close friend to Link. Her status affords her royal-like attention and she serves a special role in the ceremony attached to the race involving students rising to the status of knighthood. 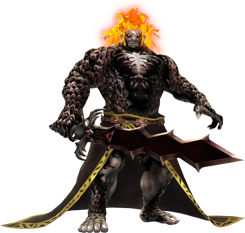 Lord Ghirahim – A member of the tribe that rules the surface world, he appears to be the one most interested in resurrecting his dark lord, the Imprisoned. 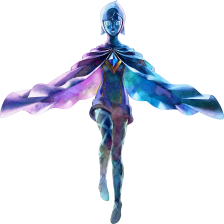 Fi – Serving as Link’s guide, she is a spirit that lives within the Skyward Sword. Though she is extremely calculated in her analysis and communication, she appears to understand the difference between good and evil. Demise – The dark lord who was banished and imprisoned in monstrous form. His goal is to absorb the power of the Goddess and take control of the world. 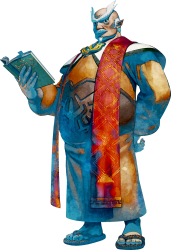 Gaepora – Zelda’s father and headmaster of the knight academy. He appears to hold a greater status among the people of Skyloft, but it is a little undefined within the small community. Groose – One of Link’s competitors at the knight academy, he is the leader of his peers and has a little thing for Zelda. Though seemingly unimportant to Link’s story, he has a purpose to aid the hero’s quest. Impa – She is the guide who aids Zelda in her quest to discover her true power. 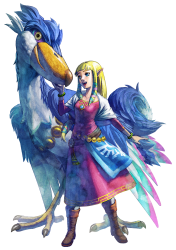 With Zelda lacking any physical treat or defense, she protects Zelda with her agility and strength. 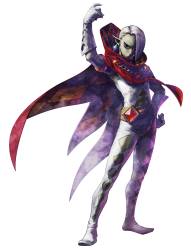 Lord Ghirahim – Link battles Ghirahim three times throughout the game. In the first session, Ghirahim only uses a fraction of his power, taking pity on the weak hero. The second session included a bit more of a struggle, leaving Ghirahim in retreat to resolve his issues of vanity. In the final battle, he cuts loose his full power and transforms his sword. These are some of the more interesting fights of the game as Link has to follow certain patterns to land hits and expose the weak points. Scaldera – Located in the Earth Temple, this fire beast is a molten crab-like creature which shoots fireballs from its mouth. A fairly easy battle, the key for Link is to use bombs to disable the beast’s momentum. 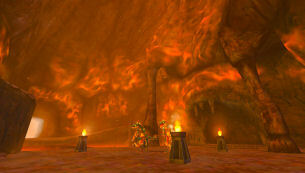 Moldarach – In the Larayru Mining Facility sits the arachnid beast. With an eye on each claw and a hidden eye in the middle of its head, the beast uses claw and tail swipes to disable its opponents. The Imprisoned – Though actually the monstrous form of the demon lord, this beast is located in the Sealed Grounds and continually tries to break free. The first attack includes the beast with just two massive legs. When it breaks free again, the beast has sprouted arms and can climb up the side of the pit. In its final escape attempt, the beast learns how to fly. Aiding in his attempts to take down the Imprisoned, Link has to rely on Groose’s technology to subdue the beast. Stalmaster – More menacing than the hordes of Moblins, this boney creature has four arms and four swords to take on Link’s one sword. Unable to block every angle, the creature relies on different sword patterns to block oncoming attacks. Koloktos – Deeper in the Ancient Cistern, Link finds the mechanical creature with six arms. Though the weak point is easy to spot, the arms help to prevent Link from having a clear shot at its chest. 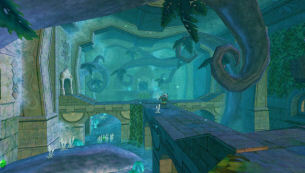 Scervo – The former captain of the large pirate ship, Scervo blocks Link’s path to the ship’s major treasure. It is a battle of back and forth blows from sword to sword. Tentalus – Awakening near the pirate ship, this leviathan uses its numerous tentacles and snake hair to protect its weak point on its eye. Link must dodge tentacles flying in every direction or get taken overboard. Levias – Though not inherently evil, this sky whale has been taken over by a parasite. Adding a collection of tentacle eyeballs, the creature can only be battled while riding a Loftwing. Bilocyte – The parasite that has taken over Levias, this acid shooting creature burrows deep into its host. It has few ways to defend itself if an attacked can get close enough. Demise – The demon lord responsible for the villainous takeover of the surface world, Demise’s resurrection is the only focus for Ghirahim. Armed with Ghirahim as his sword, he uses raw power and a similar version of Link’s Skyward Strike to take down his opponents. Shields – This game features four different shields, including the wooden, iron, sacred and Hylian versions. 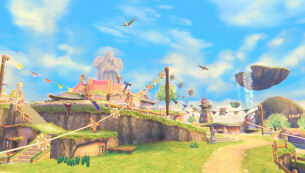 Swords – After receiving the practice sword, Link eventually finds the Goddess sword (which becomes the Master sword). Wallets – Though he only can store 300 rupees at the beginning, he can later hold as many as 9900. Seed Satchel – This bag holds seeds used by the slingshot. Bomb Bag – Holding explosives, this bag can store bombs found around the surface world for later use. Quiver – Used with the bow, this item holds as many as 35 arrows at a time. Adventure Pouch – Used to hold a variety of items, Link needs as many as possible to go on his journey. Fireshield Earring – This jewelry helps Link keep from burning up when traversing areas with extreme temperatures. 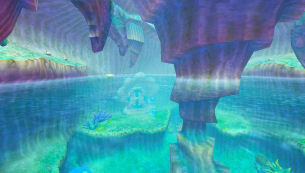 Water Dragon Scale – Allowing Link to swim, this item opens up a number of new areas to the hero. Beetle – This mechanical creature allows Link to reach items out of reach, similar to a boomerang. Bottle – Used for a number of different items, bottles can hold potions, water and faeries. Bow & Arrow – As a longrange weapon, the bow can be used to attack targets far out of reach or knock down opponents. Bug-Catching Net – Used to capture many of the insects around Skyloft and the surface world, it truly has a singular use. Double Clawshot – This item allows Link to travel to locations above pits and to greater heights. Gust Bellow – With a never-ending amount of wind, this can be used to remove sand or move objects. Mogma Mitts – An upgrade from regular digging mitts, this set allows Link to travel underground. 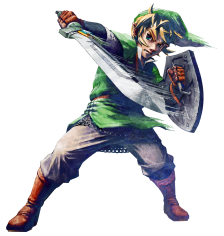 Sailcloth – Given to Link by Zelda, this cloth allows Link to glide down from great heights. Scattershot – An upgrade of the slingshot, pellets fly out in a circle pattern to catch enemies on the periphery. Whip – This item can be used to grab levers from a distance or to swing across pits. 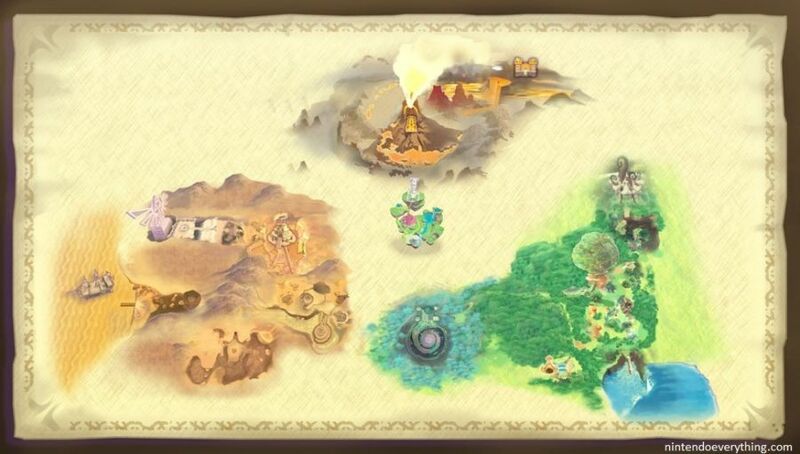 *Medals – Creating additional effects like increased rupees or hearts, medals help to bolster items needed to complete the journey. 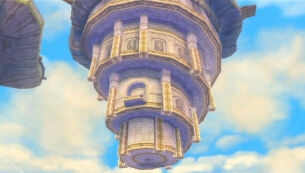 Skyloft – The town above the clouds, the townspeople call this place home. This is also the only true organized community in this world. Faron Woods – This is the home of the Sealed Grounds and woodlands. Among its inhabitants are the Kikwi and an sweet old woman. 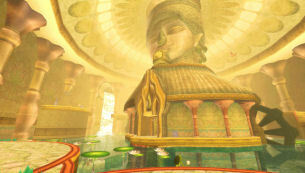 Skyview Temple – Home of the first prayer location for Zelda, the Lord Ghirahim encounters the hero first at this location. 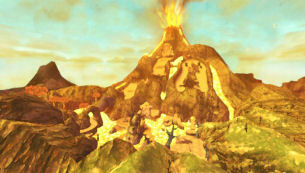 Eldin Volcano – Covered in lava, the Mogma call the heated terrain their home. 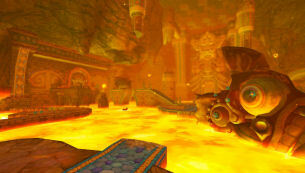 Earth Temple – Holding a similar danger of high heat, Link encounter the Scaldera on his path to meet up with Zelda. 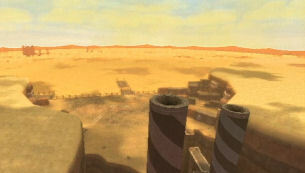 Lanayru Desert – The barren landscape includes timeshift stones which cause the earth to revert to its former lush greenery. 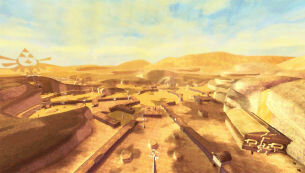 Lanayru Mining Facility – Timeshift stones affect the state of the terrain in the facility as well. Moldarach awaits Link’s attempt to pass through. Isle of Songs – Hidden in the Thunderhead, the alter provides owners of mystical musical instruments to learn songs which grant access to secret areas. Lake Floria – Home of the Parella, the lands are home to the Water Dragon. Ancient Cistern – Hidden in the Faron Woods, this temple holds Link’s first opportunity to restore the power to his Skyward Sword. 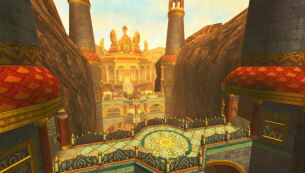 Lanayru Sand Sea – To the east of the desert, the sea had dried up years ago, but can be restored using a timeshift stone. 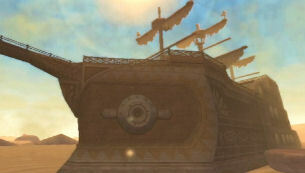 Sandship – This ancient ship used to be run by robots but has been taken over by moblins and the pirate Scervo. Volcano Summit – At the peak of the volcano, this serves as the pathway to the next temple. Fire Sanctuary – The next temple for Link to restore his sword’s power, the Lord Ghirahim chooses this place to yet again stop Link. 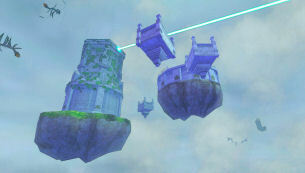 Sky Keep – A part of the Skyloft, the Temple used to exist on the surface world and holds the three pieces of the triforce. The Sealed Grounds – This location serves as the prison for the Imprisoned and the place of the resurrection of Demise. 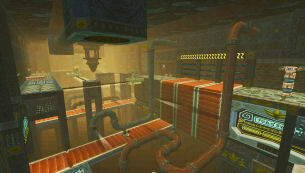 Hero Mode – After completing the game, the story can be replayed with a few changes. Recovery items are harder to come by and enemies do twice the damage. Boss Mode – In the Larayru Province, the Thunder Dragon is the keeper of a special game, battling each of the bosses over again. The mode bosses defeated equals the quality of the prize, but there are no recovery items available for use. Gratitude Crystals – Across the Skyloft and floating islands, Link can collect gratitude crystals after completing tasks of kindness to be shown to the misunderstood Batreaux. Bug Rock Mini Game – Taking bug catching to the next level, Link can compete to catch a specific collection of bugs within a given time limit. 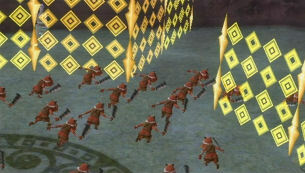 Goddess Cubes – Throughout the game, there are cubes that have the triforce symbol on them. With a Skyward Strike, the cube dissolve and open up treasures in the clouds.